Thank you for stopping by our website for a visit. Across the top of the page you’ll find handy links to other pages on our site. If you are new to Five Feline Farm, start with the About Us page. This is where you’ll learn about the plans and vision for this modern homestead. You will be introduced to the owners and cats of this operation. Mews from the Farm will lead you to our blog. There you’ll read the latest thought from one of us (occasionally one of the felines will jump on with a post). Sometimes it’s a serious treatise and other times just entertaining. 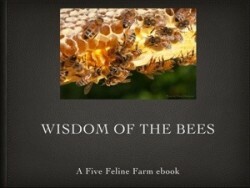 If you sign up for the free ebook “Wisdom of the Bees” you’ll get these posts delivered to your inbox. Plus an occasional bonus feature exclusive to subscribers. The Mercantile is our on-line store. You can order many of our most popular items right from this page. In 2018 we started a Podcast to talk about all things Five Feline Farm. You’ll hear us banter about what we are doing, planning and much more. If you’re interested in seeing photos of life on Farm, you will find almost daily updates on our social media. We’ve added a Resource page to help you find your way to other sites. None of these are affiliate links, just good old-fashioned helpfulness if you are looking for more information. Most of it is about honeybees. There is always something happening here at Five Feline Farm. Don’t hear it from your friends, make sure you are in the know by following the blog, Facebook, Twitter and Instagram. Once again, we appreciate your visit to our website.